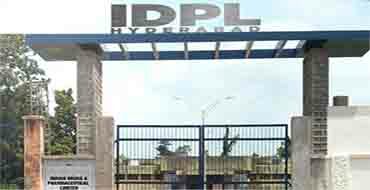 Hyderabad plant is located at Balanagar / Kukatpally in the heart of the city, 40 kms. away from Rajivgandhi International Airport (Hyderabad), in Telangana in 891 acres of land (3.61 million sq. mts). The plant was commissioned in 1967 and manufactured wide range of 47 bulk synthetic drugs like Vitamins, Sulphas, Chloroquine, Methyl Dopa, Analgesics etc. from basic stages. Now, a "National Institute of Pharmaceutical Education & Research (NIPER)"has been set-up on 19th October, 2007 at IDPL Research Center, offering training programmes in all disciplines relating to pharmacy to Graduate / Post Graduate students, thus providing pharma experts to the growing needs of Indian Pharma Industry. Just 2 kms. away from the main plant, there is a well developed township with 858 flats. The plant had formulation facilities also, but at present the plant operations are totally stopped since 1996(Bulk) and 2003 (Formulations). Only Effluent Treatment Plant, (ETP) is being operated for treating effluents of other industries. In accordance with the decision of Govt. of India, Department of Pharmaceuticals, to restart production, a new formulation project is commissioned and commercial production taken up.